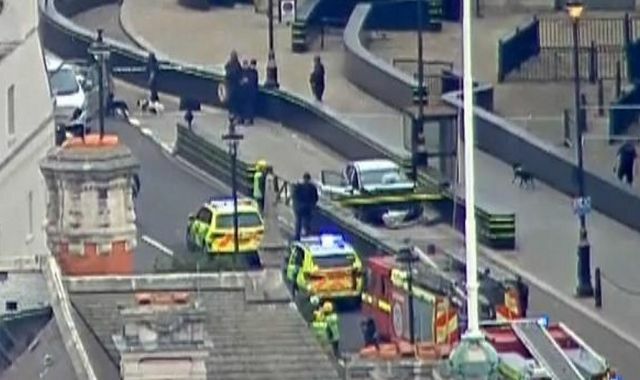 A man deliberately drove a car into pedestrians and cyclists on Tuesday before ramming it into barriers outside Britain’s parliament in what appeared to be the second terrorist attack on the building in just under 18 months, police said. Three people were injured in the incident. The driver, a man in his 20s, was arrested by armed officers at the scene moments later. He was not co-operating with detectives, Britain’s counter-terrorism police chief said. “Given that this appears to be a deliberate act, the method, and this being an iconic site, we are treating it as a terrorist incident,” London Assistant Commissioner Neil Basu told reporters. In March 2017, Khalid Masood, 52, killed four people on nearby Westminster Bridge and stabbed to death an unarmed police officer in the grounds of parliament before being shot dead. It was the first of five attacks on Britain last year which police blamed on terrorism, three of which involved vehicles being used as a weapon. The BBC, citing unnamed sources, said the man was from the Birmingham area of central England and, while not known to the MI5 domestic spy agency or Britain’s counter-terrorism network, was known to police. Police said a silver Ford Fiesta was driven through a group of cyclists and pedestrians during the morning rush hour before hitting a barrier in front of the Houses of Parliament at 0637 GMT. Camera footage showed the vehicle taking a wrong turn before veering across the road and into a security lane leading to parliament before smashing into the protective barrier as two police officers jumped to safety. The man was detained on suspicion of terrorism offences and no weapons had been found, Basu said.